He passed the interview with flying colors. “Why do you want to live with us? What challenges are you looking for? Where do you see yourself in five years?” We asked some tough questions and he had all the right an­swers, responding to each question with a confident meow. He was deliciously cute and wonderfully fluffy. When he arched his little back, pounced on five-year-old Elizabeth’s shoes and untied her laces, we decided this playful kitten was perfect for our family. We also decided to start double knot­ting our shoelaces. “We’ll take him,” I told the animal shelter worker. 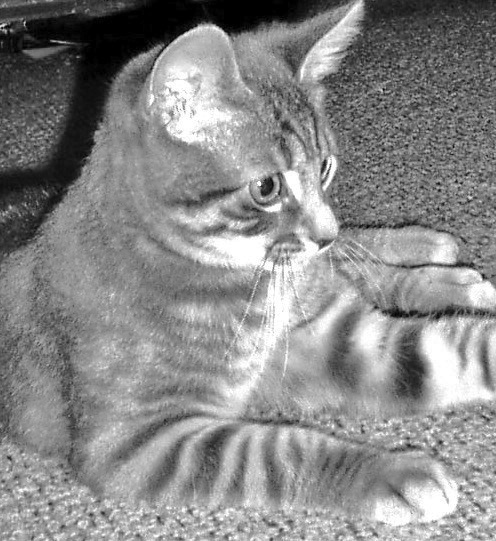 The gray tiger-striped kitten that we named “Jynx” was affectionate and curious and explored every nook and cran­ny of our house. My kids played with him, cared for him and loved him. Jynx returned their love by guarding old­est daughter Heather’s room at night, providing a wake-up pounce upon Henry in his bed each morning and continu­ing to untie Elizabeth’s shoelaces whenever possible. But despite the unconditional love he received, Jynx be­came restless as an indoor cat. Not satisfied with the confines of our home, he constantly scratched at the door, yearning for a taste of the great outdoors. Beckoned by the call of the wild, Jynx longed to enter our yard where he could be free to scamper after squirrels, frolic near the creek and attend school. Yes, attend school. From the moment we allowed him access to the outdoors, Jynx accompanied my son to gram­mar school. Like a four-armed bodyguard, he would amble alongside Henry until they reached the school grounds. Jynx would paw at the big red school door, hoping to gain en­trance, until the principal would point to the “No Pets on School Grounds” sign and send him on his way. At three o’clock in the afternoon, Jynx would return to school to es­cort Henry home. We worried about Jynx, knowing that by spending time outdoors, he was more vulnerable to dangers such as vicious dogs, threatening raccoons, street traffic, the harsh elements of winter and even school bullies. But we remembered the adage, “If you love something, set it free,” and prayed for his safety. We worried most when Jynx was gone for days on end, especially since he tended to be naively trustworthy and often sat in the middle of the street, not understanding that he was a dark cat camouflaged against black asphalt. One Saturday morning, a neighbor called to tell us Jynx was down on Weston Avenue. “He’ll find his way home. He always does,” I said to her. An hour later, I drove down Weston and spied a striped gray cat lying in the middle of the road. “Jynx!” I laid on the brakes. I ran to him but it was too late. I knew my children would be devastated to learn their young cat had been killed by a hit-and-run driver. Picking him up carefully, I took him home and broke the news. Later that day, I returned to look for Jynx’ identification collar, which had undoubtedly flung off upon impact. I found nothing. Back home, we placed Jynx in a cardboard box and buried him in the backyard in a hole that was 3-feet deep. We had just begun the memorial service when Henry interrupted. “Just a minute,” he said and disappeared into the house. Thinking he needed time to compose himself, we were surprised when he quickly returned and tossed some­thing into the shallow grave. We heard a small thud. “There’s Elizabeth’s sneaker, I know it was your favorite,” he said earnestly to Jynx, gazing down at the box. Elizabeth started to open her mouth in protest, but changed her mind. Leaning on our shovels, we rested a moment, each of us re­flecting on our short time with Jynx. “I loved how he took walks with us like a dog,” said Heather. “I loved him even though he drank out of the toilet,” Henry declared. “I loved those shoes,” said Elizabeth. After the service, we went back inside and lit a memorial candle on the mantelpiece. “What? !” we replied in unison. Our eyes immediately traveled to the grave site, searching for any sign of distur­bance, but we saw none. We peered toward our neighbor’s house and observed Jynx trotting over to us. We went wild, hugging and kissing him. He took it all in stride, oblivious to the fact that until that moment, we had been convinced that he had lost one of his nine lives. “But if this is Jynx, who’s in the . . . ?” Heather inquired, pointing to the grave. We shrugged and looked at each other in bewilderment. We confined Jynx to the house after the “incident.” Af­ter all, this time we had been witness to one of the fateful dangers of outdoor cat life—cat versus car. But listening to Jynx’ familiar scratching at the door day after day made it clear to us that it wasn’t enough to offer him freedom from life in an animal shelter. We needed to allow him the free­dom to explore life. So we let him outside again. And although we constant­ly worry about Jynx and receive phone calls regularly from concerned neighbors, we have the satisfaction of knowing that our cat is contentedly enjoying the best of both worlds. One shoelace at a time. 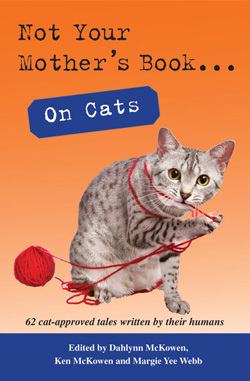 Again, this story appears in “Not Your Mother’s Book…On Cats.” The book is filled with 62 cat-approved stories written by their humans. Purchase this book today from your favorite retailer, Amazon (http://amzn.to/1CdPXYt) or Barnes & Noble (http://bit.ly/1zFY1kd). Too funny. I didn’t think this had ever happened to anyone else! My dad scooped up a dead cat on his way to work one morning and put it in the trunk for his car. He made the hour commute to work and called my mom and they struggled on how to tell us kids. Our male cat Boss was had been MIA for over a week. Before my dad got home from work Boss had showed up again. I never knew what he did with the other orange cat??!!?? For anyone who has “almost” lost a pet, this story is totally heartwarming and humorous. Our kitties have a way of surprising us and Jynx is no exception! What a well-written and delightful story. You’ve really made me miss my cat, Sausalito, who passed away after many happy years with us.